It has been a busy couple of weeks, and despite a profound lack of sleep throughout that period, I feel more rejuvenated and animate than I have had in a very long time. The end of June saw me attending the Ionian University’s 7th Audiovisual Arts Festival in Corfu as part of the University of Salford’s delegation, where I performed a newer iteration of the Symbiosis project. Most of the alterations involved new sound material fed into the processing units and toning down the motion sensors’ response, resulting in more subtle modulations. A special thanks must go to the great artist/graphic designer and good friend of mine, Joe Beech, who accompanied me to Corfu, giving a stellar performance as my symbiont and resulting in creating a great piece of abstract art. Although the performance was generally well received, much of the audience seemed uncertain about the correlation between motion and sound modulation, which leads me to believe that the subtle approach may not be as appropriate for the project, and its probably best to revert to the more obvious response mechanism. Further to the performance, I also delivered a presentation going through the concept and mechanics of Symbiosis, attended by both Greek and English speaking students. I was particularly happy to engage in a lengthy q&a session after the presentation, which lasted nearly as long as the lecture. Whilst performing in front of a new crowd was enjoyable, the festival’s further programme left me with a lasting impression on several different levels. Firstly, I was immensely impressed by the facilities and level of organisation throughout the festival. Under the guidance of professor Andreas Mniestris the Ionian University has established an excellent academic environment, which is reflected in the works of both undergraduate and postgraduate students, as it is in the pieces created by the other associated artists and academics. The programme also featured delegations from De Monfort University, Leeds MET, the New York City Electro-acoustic Music Festival, and Florence’s Tempo Reale. The included works dealt with electroacoustic compositions, incorporating both tape and live instrumentation, with most of works being of very high quality in concept and aesthetics. Also worth mentioning Apostolos Loufopoulos’ and Myrto Korkokiou’s live performance involving flute and effect processing, Nikos Massaras’ Glitch, and Stephen Killpatrick’s Strike, involving a rather precarious recording of a burning match. Other than the performances taking place at the university’s facilties, further events were held at Polytechno, a gorgeously minimalistic art and exhibition space in Corfu’s Old Town. Fellow Salford delegate James Medd was programmed to present Physical Echoes, an Arduino based sound reactive installation, albeit prevented from doing so due to technical issues. However, his presentation more than made up for it, and gave a great insight on the installation’s function. Another Arduino based performance was presented by Kostas Koukoudis, involving a custom-made sound controlling glove. 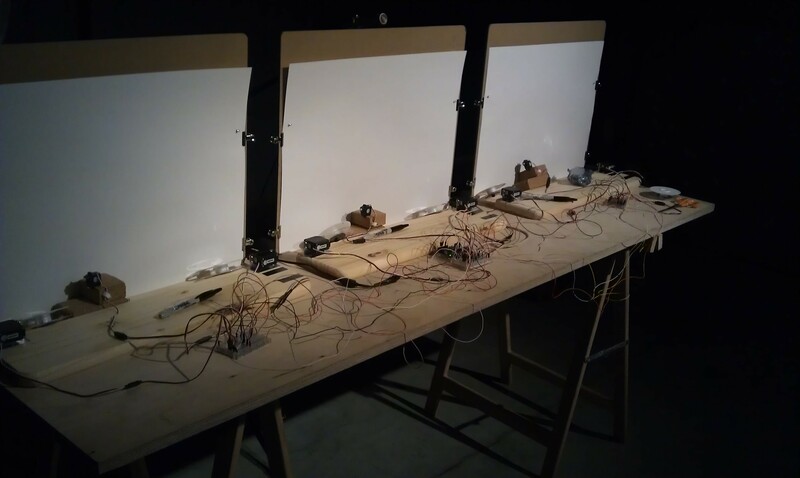 Although the comprising parts of the emitting soundscape were rather minimal, the level of control was impressive and has motivated me to look further into the possibilities presented by Arduino contraptions.